Ever since Bajaj launched the Dominar 400 in the Indian market, fanboyism has started surfacing online quite frequently. Bajaj even directly targetted the Royal Enfield brand with the extremely popular “Haathi Mat Paalo” ad, which created quite an uproar in the social media world. Since then, a lot of videos showing the capabilities of both the bikes have come up and here is one more such video. The video shows a Bajaj Dominar 400 and a Royal Enfield Classic 350 taking on the same terrain. The video has been taken from a helmet camera from behind and shows how both the bikes tackle the situation. It can be seen that the Bajaj Dominar 400 is struggling quite a bit and has got stuck after reaching a point. The Royal Enfield rider stops for the Bajaj Dominar 400 and then goes past him easily. The Bajaj Dominar 400’s rear wheel can be seen spinning on the surface as it struggles for traction. Even though the bike has enough power, the wheels struggle to find any traction from the surface that causes the bike to get stuck at that point. On the other hand, the Royal Enfield gets away from that point quite easily. Interestingly, the Classic 350 is one of the best-selling bikes in the segment. It is powered by a 346cc, air-cooled engine that churns out a maximum power of 19.8 Bhp at 5,250 rpm and a peak torque of 28 Nm at 4,000 rpm. The Bajaj Dominar is powered by a much more powerful engine. The 373.2cc, liquid-cooled, single-cylinder engine of the Dominar 400 churns out a maximum of 35 Bhp at 8,000 rpm and 35 Nm of peak torque at 6,500 rpm. The engine of the Royal Enfield squeezes out the maximum power at a much lower RPM, which helps it in such situations. Also, the bike’s tyres play a major role while negotiating such situations. The Royal Enfield Classic is using an aftermarket alloy wheel but it is not known if the tyre is stock or has been upgraded. One of the biggest factors in negotiating such situations is the rider himself. The Dominar is much more capable on paper and if a rider utilises its capabilities fully, it can be quite capable. In fact, there are a group of people who have done the Trans-Siberian stretch on the Dominar and are also attempting riding from the North Pole to the South Pole on Bajaj Dominars. 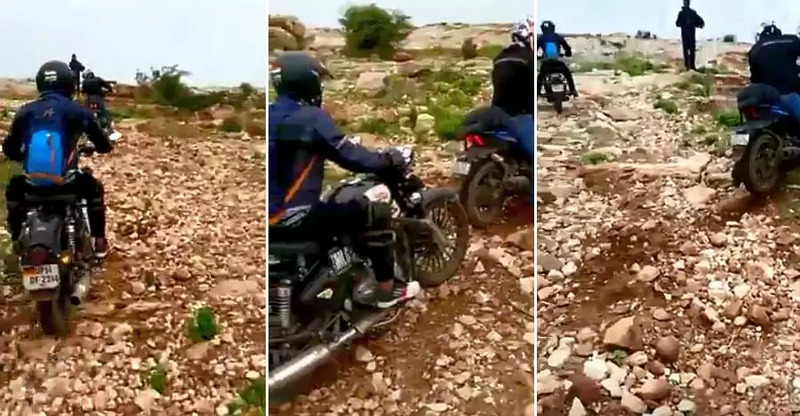 Videos in the past have shown how a Bajaj Dominar rider can go past challenges, while the Royal Enfield gets stuck. The same is true vice-versa. While the motorcycle can provide a platform for the rider, the ultimate control lies with the rider and how he controls the motorcycle to get out of the situation.